When I first heard about this book, I was utterly shocked, even as a native Southerner who has done a little bit of reading on the Civil Rights movement. How could this be true? How could this have been legal? How did this go on for so long? 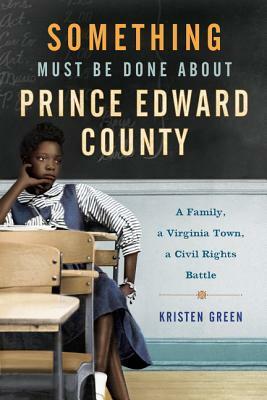 After Brown V. Board of Education, as the rest of the South either prepared to integrate or to fight directly, Prince Edward County in rural Virginia instead decided to close all their schools. Just close them. Seriously. Then the white families opened a private school just for whites. They took some equipment from the closed public schools. But mostly the funded the new schools themselves, but with some "grants" from the state and region. Yep, they used public funds for these private white-only schools. Minds blown yet? The author, Kristen Green, grew up on Prince Edward County. And she went to that white-only school. In the 1980s. Yes, the public schools had reopened by then, but the private school, which most of the white attended, was still white-only. She hadn't thought much about it as a child, but when she grew up and went away to college, she was fascinated by fellow students of other backgrounds. Eventually her best friends were a mix of many colors, and she married a mixed-race man, and now has two mixed-race children. And while working as a journalist in Boston, she thought about how her grandparents probably wouldn't have liked her own children very much. Which was a sad realization. And it made her think more about her hometown. And how she was raised. And how her family would be received there. She began looking into the history of the school system and was horrified to discover that her grandfather had been instrumental in starting the whites-only school. She'd thought her family had just gone along with it--not actually helped to create the situation. After all they had a beloved African-American cleaning lady whose own daughter had had to move away to go to school during that era. How could they have seen the impact on their own employee's family and not cared? From there, she started doing a vast amount of research and interviews, eventually even moving back to the town, living only a block away from her parents' house, and volunteering at the local civil rights museum. This book is an interesting mix of memoir and history. It isn't often than a journalist has such an inside track like this on her subject. And Ms. Green melds the two genres beautifully. I wasn't sure they'd hold together so well but it's just great. She's obviously done a vast amount of background and research, and while some on the town were reluctant to speak with her, as a local, she surely got more people to speak with her then an outsider would have. It's amazing that more than 50 years after this, people still are proud of the decision, ashamed of their town's history, and sometimes even did refuse to talk to Ms. Green. This region still has to come to terms with what they did. This book is an excellent start. I'm glad to see this one was a good read since I've been eyeing it.